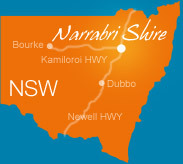 Regardless of whether you are passing through, staying for a short break or looking to relocate your business or family – Narrabri Shire is exactly what you are looking for. You will find the conveniences of city living within Narrabri Shire. There are modern cafés and restaurants as well as a state-of-the-art theatre complex bringing the latest movies and live performances to the community. There is a growing appreciation within the conference market of Narrabri Shire’s facilities offering professional convention and workshop services to local, national and international businesses. A range of outdoor festivals are celebrated throughout the year. There is a wide assortment of social, cultural and sporting events to keep people of all ages and tastes entertained. Residents are never bored due to the amount of activities available for the whole family. Narrabri Shire is a modern regional growth centre encompassing a strong business community without the stresses and pressures of a city environment. The area has diversified from its traditional agricultural base of grain, cotton, wool, beef and prime lamb production to coal mining and gas extraction and exploration. The advent of these new resource based industries in conjunction with ancillary business is providing a breadth and depth of job opportunities for the Shire. The retail sector in each town continues to strengthen and diversify, creating dynamic shopping experiences, bringing city pleasures to the country. The topography of the area varies from fertile river plains through to rugged mountain ranges. As the lifeblood of the Shire, the Namoi River meanders through the vast plains. People who enjoy the outdoors will not be disappointed with the range of activities and sights within the Shire.